Ariana Pernice, V.P. Hilton Head Bluffton Chamber of Commerce CVB; Rob Hernandez, Savannah City Manager; Chocolate the Moose Frontier Airlines; Dave Legasse; Visit Savannah Board Member; Bill Hubbard, President Savannah Area Chamber of Commerce; Shirley James, Vice-Chairman Savannah Airport Commission; Jonathan Freed, Director of Corporate Communications Frontier Airlines; and Joe Marinelli, President Visit Savannah. Last week, low fare carrier, Frontier Airlines, announced two new non-stop routes from Savannah/ Hilton Head International Airport. Frontier will now offer the longest route from Savannah with nonstop flights to Denver and will be the only low-cost airline flying to Philadelphia. Flights are available for purchase now at flyfrontier.com with introductory fares as low as $39* each way. The new service to Denver will be the first to fly to the city and the longest nonstop route from Savannah. The Denver-based airline will offer service from Savannah to Philadelphia on Tuesdays and Thursdays starting May 1 and to Denver on Fridays and Mondays starting on May 4. 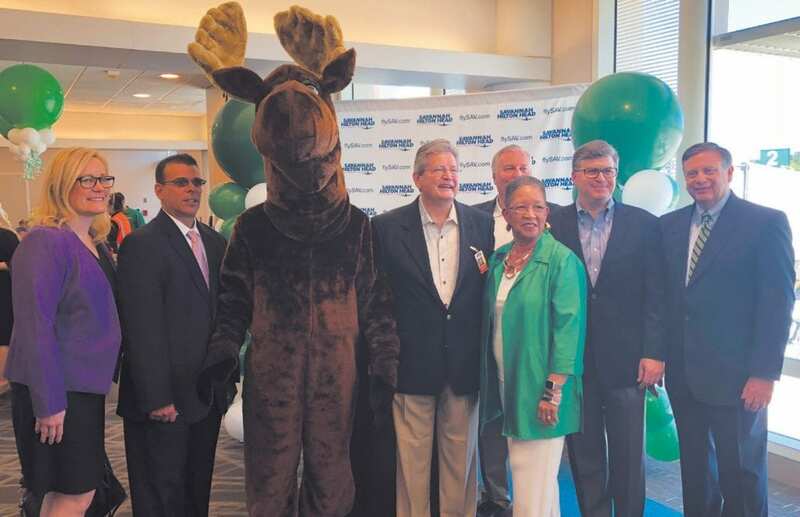 “With the introduction of Frontier’s new service we are making air travel more accessible and affordable for travelers in Savannah,” said Jonathan Freed, Director Corporate Communications for Frontier Airlines. “Getting nonstop service to Denver has been a top priority for Savannah/ Hilton Head International for several years and is one of our top target markets. We appreciate Frontier’s decision to bring this connection to our airport and our region, and we will work hard with them to make sure it’s successful. We’re also pleased to have additional service to Philadelphia, and we believe it will be very successful as well,” said Greg Kelly, Executive Director, Savannah Airport Commission. “Frontier brings non-stop service to one of our top cities of origin as well as an emerging market with Denver and it’s great opportunity for exposure in both regions,” said Bill Miles, president & CEO of the Hilton Head Island-Bluffton Chamber of Commerce. “We are extremely excited about the prospect of reaching Frontier Airlines’ customers in the Denver and Colorado area. As Savannah grows in popularity as an attractive visitor destination, we see more and more people traveling from points west,” said Joseph Marinelli, President, Visit Savannah. Frontier flies one the youngest fleets in the industry consisting of Airbus A320 Family jet aircraft. With nearly 200 more new aircraft on order, Frontier will continue to grow and modernize its fleet to deliver on the mission to provide affordable travel across America. By 2026, the company will be in a position to deliver Low Fares Done Right to more than 50 million passengers a year. Frontier’s young fleet also ensures that the company will continue to keep fares low and that customers will enjoy a pleasant and reliable experience flying with the airline.